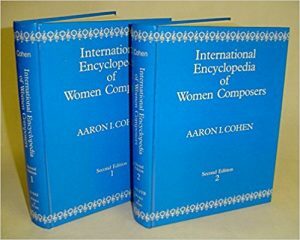 I have just taken delivery of a good ex-library copy of the weighty two-volume ‘International Encyclopedia of Women Composers’ by Aaron I Cohen,1 which will be useful for some research I am doing (as well as for writing some materials to accompany a series of concerts by the excellent Bristol Ensemble next year). The encyclopedia weights about 3½kg, has almost 1,200 pages, and lists 6,196 women composers spanning all continents and over four millennia. Each entry includes brief biographical details, lists of works, and references for further reading. For those of us who spend a lot of time researching and analysing online data, it is both refreshing and frustrating to encounter sources like this Encyclopedia. It is refreshing because it is much more comprehensive than any single source you will find online. It is well organised and cross-referenced, and is not constrained by the rigid data structures that can sometimes limit the content or usability of online sources. But it is also frustrating because it is not online. It is a book – or rather two quite large books – and all of that information is just ink on paper, rather than data in a computer file. Without a lot of typing, or some sophisticated scanning technology, it is very difficult to analyse. It is, of course, designed to be consulted for information about specific individuals, and it does that very well. However, to analyse the population of women composers represented in the encyclopedia, the only practical option is to take a sample (itself a time-consuming process) and work with that using good old-fashioned statistical techniques. As is often the case with well-designed reference books, the appendices of the encyclopedia are particularly useful. They include listings by country, century, and musical genre, for example, all of which could be used as the basis of sampling, depending on the subject of investigation. Also included is an appendix with pictures or photographs of nearly 600 women composers, and another with a useful list of the (often male) pseudonyms they used. There are even lists of notable facts and quotations, which I’m sure will come in useful for writing programme notes! Comprehensive as it is, the 6,000+ names in the International Encylopedia of Women Composers do not include some of those that are easily found mentioned in other sources, such as Carlotta Cortopassi (who appears in Pazdirek’s Handbook) and Charlotte Oliver (listed by Hofmeister in his Monatsberichte)2 There is never a definitive single list of anything in the world of music history. Which is reassuring. Cite this article as: Gustar, A.J. 'Encyclopedia of Women Composers' in Statistics in Historical Musicology, 28th November 2017, https://www.musichistorystats.com/encyclopedia-of-women-composers/. Second edition (1987), published by Books & Music (USA) Inc, New York. See the Printed Music Datasets page for details of these.